Not sure why all the bloggers like the 1,000 or 1,500 mile bonus offers on a 3 day rental. Most rental car agencies offer a free day on a 3 day rental. So, unless you are on a VERY cheap rental, the free day is going to be worth more than 1,000 or so miles. There are several ways to evaluate these offers. And one way is to consider this: if you decided to use some AAdvantage Miles for a car rental, you’d likely need to redeem at least 5,000 miles for a single day. So if you compare a free day rental (pardon the oxymoron) to 1,500 miles, the free day provides a better value. • Reserve a compact through full-size car in the United States. • Requires a 3-day minimum (5-day maximum) rental with a Saturday overnight keep. To qualify for this offer, you’ll need to use Contract ID 5026041 and Coupon ID NF3361JDP at the time of your reservation. Go here for complete details and the terms and conditions. 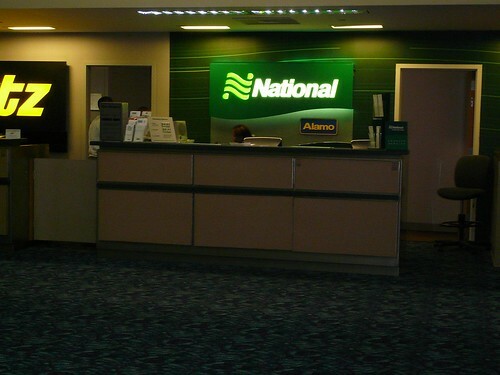 Also, National Car Rental is celebrating 25 of their Emerald Club loyalty program., and to celebrate they’ve teamed up with The Weekly Flyer to give away two $25 gift cards to Points, Miles & Martinis readers. All you have to do is share how you traveled 25 years ago. Twenty five years ago, AAdvantage Geek was traveling on Spring Break while waering a Spuds MacKenzie t-shirt! Go here to enter! I always assumed that those traveling on business expenses preferred to get themselves miles rather than save their company the cost of a days car rental. In fact, I would be interested in hearing other reasons for people selecting miles as car rental with a miles offer costs A LOT more than alternatives. For example, I recently look at a 3 day weekend rental in Atlanta. Following links to miles offers got me about US$65 a day. Going through Costco got me $28 a day for the same car class. I am spending my own money so will go for the cheap daily rate everytime! @ matt ward – You bring up an interesting point. I prefer the miles, personally, because I’m usually traveling on business and I’m never the one paying for my rental. When I travel for myself, I almost always end up someplace with excellent public transportation and seldom rent a car. But then I know a lot of people that are just the opposite, and almost always travel to place where you have to have a car, so I guess different people will make different choices. I use the car rental service every time I am in Dublin. My stay is usually for business purposes with very less travel. Still I use the car rental service for a free mind and travel when I have some buffer time between meeting days. I also prefer car rental service because whenever I go for business meetings I use car as per my convenience. Whenever I feel free I would like to ride and so many times I spent my vacation in different countries, at that time I drive for more miles in that case it is better to have a day rental service.